Just a few days after the release of the complete sound track of Metal Gear 2 - Solid Snake, J-War treats us with more remakes. Among them almost exclusively games from Konami. Only Golvellius by Compile is the "odd ball" here. Music we heard before from other composers, but also some tunes which were not published by anyone else yet. 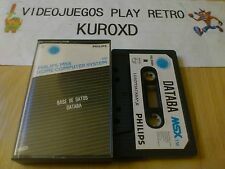 Our download database contains over 1.100 different free MSX downloads. If you have created MSX software or an soongs like this that can be freely redistributed, please do share it with the visitors of the MSX Resource Center by submitting it to our downloads database. Maybe next month your software or music will grace the top 10 charts! Names are fixed, you can add them now, naked ! Thanks! This will be a nice addition on my mp3 player. Could we get them as one zipped file? Whenever i see you, i need to remove my pants !